Fianna Fáil supporters call Brian Cowen a “dead man walking”, says Conor Lenihan, while Billy Kelleher and Willie O’Dea also speak out. 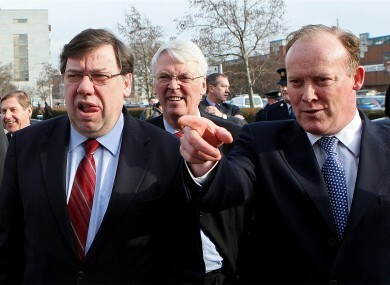 Conor Lenihan (right), in a piece for today's Evening Herald, said party activists believe Brian Cowen is a "dead man walking". A NUMBER of ministers of state in Brian Cowen’s government have this lunchtime called on their fellow Fianna Fáil TDs to vote against the leader in tomorrow’s motion of confidence. Science minister Conor Lenihan – the younger brother of finance minister Brian – has said Cowen is seen as a “dead man walking” by the party grassroots, and said his party needed to acknowledge the public appetite for change. In a comment piece written for today’s Evening Herald, Lenihan argued: “There is a real fear that the party is facing extinction and will not continue to exist after the election. The piece, which effectively outlines Lenihan’s opposition to Cowen’s continued leadership, may reveal underlying tensions within the Lenihan family – Conor’s aunt, Mary O’Rourke, refused to tell Morning Ireland how she would vote in tomorrow’s crucial secret ballot, while Cowen has himself said he enjoys the full support of Brian Lenihan, Conor’s brother. Lenihan’s article came after Billy Kelleher – another junior minister, with responsibility for trade and commerce – said he would be voting against Cowen in tomorrow’s critical vote. Siding behind his fellow Corkman, Micheál Martin, Kelleher said the time had come “for a change of leader who will put forward a positive agenda and engage with the public. “I believe that, as a party, Fianna Fáil must better communicate its achievements to date and more clearly articulate its plans for the future including the forthcoming general election. “A change of party leader… will allow Fianna Fáil to engage more fully with public opinion,” Kelleher said. The manoeuvres come after Brian Cowen yesterday announced he wished to lead Fianna Fáil into the next election, and that he would tabling a motion of confidence in his own leadership – a move which prompted Micheál Martin to say he would vote against it. Kelleher this morning told RTÉ’s Today with Pat Kenny that he – like Martin – had offered his resignation from the ministerial ranks, but that Cowen had said there was “no need for us to discuss that at the present time”. Martin, meanwhile, told Ryan Tubridy he was confident tomorrow’s motion in favour of Cowen would be “narrowly lost”. Michael Moynihan, another Cork TD based in Cork North West, has also called for a change of leadership “in the interests of the party” – and this lunchtime, former cabinet minister Willie O’Dea also said he would be opposing Cowen’s motion. Email “Junior ministers line up to force Cowen out”. Feedback on “Junior ministers line up to force Cowen out”.